Pictured is the last remaining section of the old Boomerang Lodge, which is slated for redevelopment. On Monday, the City Council approved an amendment to a 2006 ordinance adding 5,500 square feet to the project. Owners of the Boomerang Lodge, a blighted, historic property that has sat dormant on Hopkins Avenue since the Great Recession, plan to move forward with approvals from 2006 and build 47 hotels rooms, five free-market residential units and two affordable-housing units. Local partner Steve Stunda said Friday that redevelopment at the Boomerang site will begin when the city issues a building permit, and the new condominium-hotel could open at 500 W. Hopkins Ave. as early as June 2017. Stunda’s group has teamed up with Lowe Enterprises, whose subsidiary, Destination Hotels, manages The Gant. Stunda said The Gant’s general manager Donnie Lee will open the new lodge. Boomerang ownership, which includes Baltimore-based Alex Brown Realty, purchased the property in 2005 for $13.5 million. A year later, the group demolished part of the lodge to make way for the 2006 development. However, finances fell through during the recession and activity didn’t pick up until 2011, when the Aspen City Council approved plans to build an affordable-housing complex at the site. But the 40-unit project was halted when neighbors filed a lawsuit seeking reversal of the approval. Pitkin County District Judge Gail Nichols ruled against the neighbors, and by early 2014, the two parties had come to an agreement to end litigation. That same year, owners submitted and withdrew new redevelopment plans after the Planning and Zoning Commission recommended denial. Aspen senior planner Sara Adams had recommended against the project in August because the 41,300-square-foot development consisted of too much free-market-residential space and not enough lodging. It called for 37 percent lodging and 54 percent free-market, or 54 lodge units and 14 free-market units. The 45,000-square-foot structure approved in 2006 calls for 66 percent lodging and 30 percent free-market. 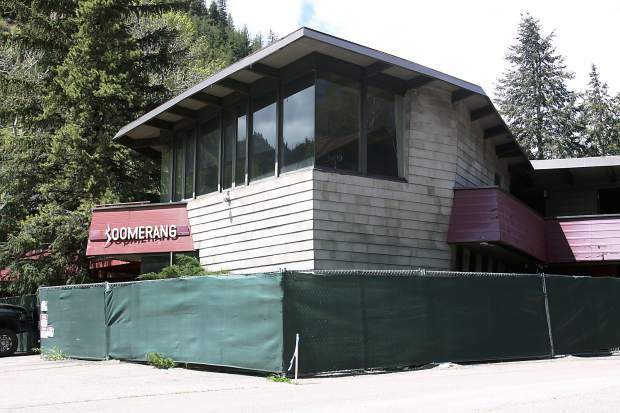 Stunda said he is meeting with city planners Jessica Garrow and Jennifer Phelan next week to see if the Boomerang will participate in the recently passed small-lodge preservation program. The program provides cash incentives for Aspen’s smaller, more moderately priced lodges. Development breaks include fee reductions, energy-efficiency rebates, free inspections and expedited reviews. The city estimates that it could unload anywhere between $1.5 million and $2.3 million into the new program over the next five years. Austrian immigrant Charles Paterson, who studied at Frank Lloyd Wright’s Taliesin studio in Wisconsin, opened the three-unit Boomerang Lodge in 1956 only to expand it four years later, adding 12 rooms, a lounge and a pool. Expansions took place again in 1965 and 1970. The historic building is regarded as Paterson’s life’s work, consisting of walls and fireplaces of concrete-battered blocks and windows with corners of glass. Councilman Adam Frisch said Friday that he remains excited any time a possible lodging product comes to town, adding that if the group follows through with the plan, it would be a great addition to Aspen.